Under the ‘Combined list’ tab, you will see that we have drawn together three major sources of evidence on effective learning. We are also able to show that this is compatible with cognitive science. 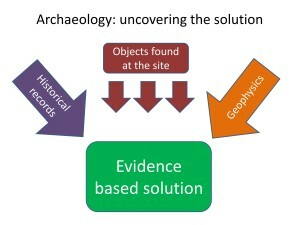 The secrets of the site are revealed by the evidence. At first this looks rather complicated, but, when we group the effective methods, a much simpler picture emerges: all the effective methods can be grouped in the 6 sections outlined below. If you were doing an archaeological dig, at first you may find isolated artefacts. Someone finds some bones, another some pottery, the electronic gadgets show up the outline of a building, historical records gives some clues. Initially different people may draw different conclusions and make educated guesses about what lies beneath the ground and the lives of those who lived there. After a while, so much evidence has been gathered that you can stand back from the dig and see the whole picture. Now all the small pieces of evidence form part of a bigger picture. It all starts to make sense. If the theory is correct, new information gained by later digs should fit the overall big picture. The secrets of learning are revealed by the evidence. The same thing has started to happen in education. All these different research papers, books, lists of effectiveness, myths etc can be confusing, until we see the pattern they form. For years we only had snippets of evidence and all sorts of different theories exist. Few in education could agree. Now with the major analyses from Hattie, Marzano, EEF etc and the new knowledge of the brain have given us the outline of the big picture. Among those who focus on the evidence (rather than opinion or individual research results) there is a high degree of agreement. It is no longer a complex puzzle. This diagram helps explain the big picture. 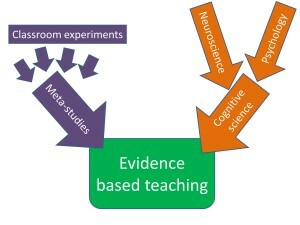 It is developed from one used by Geoff Petty (Evidence-Based Teaching). It combines and summarises the evidence from the classroom and the cognitive science. The words in red refer to high-effect methods (see ‘Combined list’ under this tab). Words in green refer to cognitive science. Improving behaviour has a high effect-size. Clear rules, applied without too much discussion and backed up by senior staff are almost always effective. Students who have a Growth Mindset achieve, on average, one grade higher than those with a Fixed Mindset. The work of Carol Dweck and others are widely available. ‘Not labelling students’ is a vital part of this as labels often reinforce a Fixed Mindset. 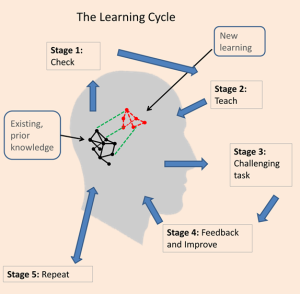 Brain ‘plasticity’ shows that all students can improve with practice. Students need to know the value of the learning. Since new learning and memories are built on what is already known, students of teachers who assess them, and intervene early, make significant progress. Prior knowledge for a topic can be assessed by ‘relevant recall questions’ to check and correct prior learning before the new learning. Effective ways to deal with missing prior knowledge include: early intervention, phonics, small group, one-to-one or peer tuition. There are several interventions designed to help slow readers catch up: reciprocal teaching, repeated reading, vocabulary and phonics all apply here. The meanings of words needs to be secure in long-term memory. Similes and analogies are links between the new material and what the student already knows. Students can receive their first contact with new material either from your teaching, or by reading a book, watching a video or demonstration etc. This reflects the four main ways for students’ brains to receive input: 1) visual images and objects, 2) visual words, 3) verbal words and 4) by touch and action. Of the four, reading (visual words) is the most problematic. Consequently, most struggling students can be helped by using the other inputs. Use Graphical Methods and Tactile stimulation. A multi-sensory approach with good use of brain’s visual areas is most effective. Students require both levels. Advance organisers give the big-picture at the start of a topic and Summarising enables students to pull a big-picture from the detailed learning they have done. New material should be presented in short chunks and the process of forming long-term memory started before the next new material is presented. If the task is too easy, it will simply exercise prior knowledge. If it is too hard, the student will fail. In both cases, no learning can take place. A challenging task, focussed on the objectives, is one at which the student can achieve with a bit of struggle and feedback. ‘Acceleration’ is effective, the evidence suggests, as most tasks are not sufficiently challenging and increasing the challenge also increases the learning. Goals and learning objectives need to be clear so that students can focus on what matters. While a few students can ‘think things through’ for themselves, most need help or training. Hypothesis testing and problem solving (rather than factual recall) both offer this opportunity. The need for assistance in doing the task is the reason collaborative or cooperative methods can be so effective. In the process of discussion in a group, students have to articulate their thoughts and decide whether another opinion is better than their own. Note-making and summarising are both tasks to promote thinking. Feedback is essential to check that the learning is not mistaken (that the brain is making the right links). It needs to happen during the process, not after it. It occurs near the top of all three lists and should be considered essential. Sometimes the term ‘Assessment for learning’ is used. Feedback can be verbal or written. It can be given by the teacher or by peers or the student themselves using assessment criteria or mark-schemes. It should include what is correct (the medal) and what needs improving (the mission). If the student does not act on the feedback, little new learning takes place. 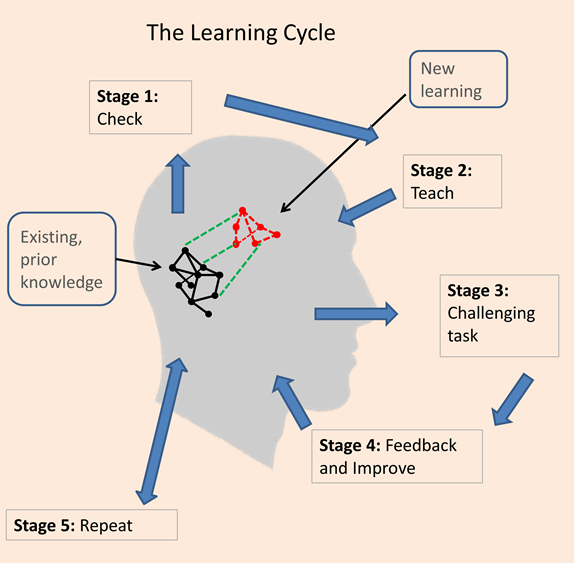 It is central to mastery learning: a technique where students keep repeating a piece of vital learning until they achieve 80% in an assessment. This is repetition combined with a recognition of the need for secure prior knowledge..
Repetition is vital to secure long-term memories. Spaced practice, mastery learning, repetition and homework (not at primary level) all give opportunities for repetition. Once new knowledge is understood, it can be safely learnt by heart as it will secure the links to prior knowledge. What’s in the Evidence Bank?